This species is accepted, and its native range is Kansas to SE. U.S.A., Bahamas. Perennial. Culms erect; 90-150 cm long; 1.5-3 mm diam. Culm-internodes distally glabrous, or pubescent. Lateral branches lacking. Leaf-sheaths 20-45 cm long; glabrous on surface. Ligule an eciliate membrane; 2.5-4 mm long. Leaf-blades flat, or involute; 20-50 cm long; 3-6 mm wide. Leaf-blade surface scabrous; rough on both sides. Leaf-blade margins scabrous. Leaf-blade apex acute. Inflorescence a panicle with branches tipped by a raceme. Peduncle 25-50 cm long. Panicle open; lanceolate; secund; 15-40 cm long. Primary panicle branches appressed. Panicle axis glabrous. Racemes bearing a triad of spikelets, or few fertile spikelets; 1-3 fertile spikelets on each. Rhachis fragile at the nodes. Rhachis internodes filiform. Spikelets in pairs, or in threes. Fertile spikelets sessile; 1 in the cluster. Companion sterile spikelets pedicelled; 1 in the cluster, or 2 in the cluster. Pedicels filiform; 4-6 mm long; pubescent. Companion sterile spikelets represented by barren pedicels. Spikelets comprising 1 basal sterile florets; 1 fertile florets; without rhachilla extension. Spikelets lanceolate; dorsally compressed; 6-8 mm long; falling entire; deciduous with accessory branch structures. Spikelet callus pilose; base obtuse. Spikelets comprising 1 basal sterile florets; 1 fertile florets; without rhachilla extension. 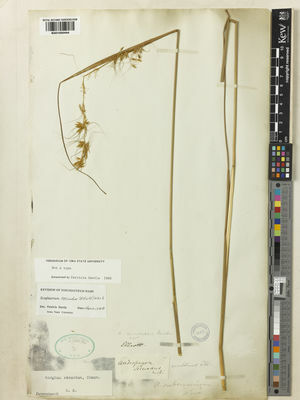 Spikelets lanceolate; dorsally compressed; 6-8 mm long; falling entire; deciduous with accessory branch structures. Spikelet callus pilose; base obtuse. Glumes dissimilar; firmer than fertile lemma. Lower glume oblong; 1 length of spikelet; coriaceous; dark brown; without keels; 7-9 -veined. Lower glume surface pubescent. Lower glume apex truncate. 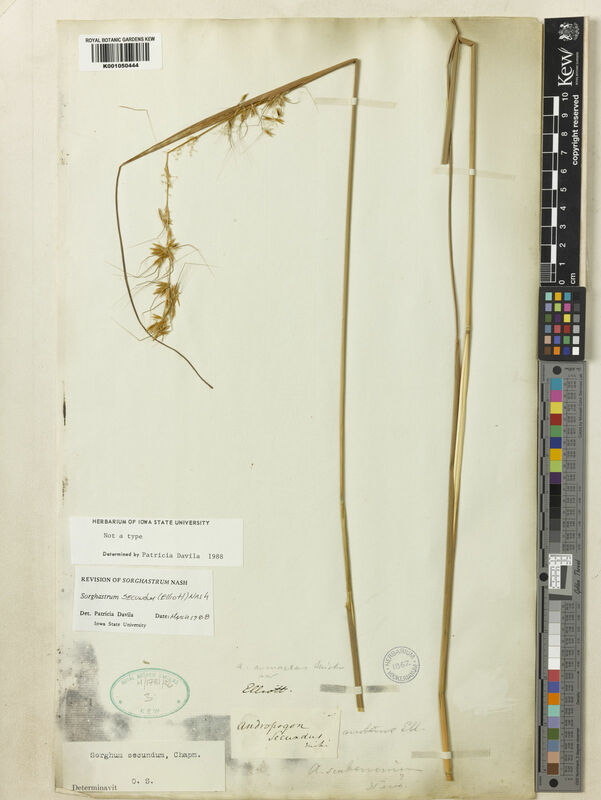 Upper glume oblong; 1 length of spikelet; coriaceous; dark brown; without keels; 5 -veined. Upper glume surface glabrous. Upper glume apex acute. Basal sterile florets barren; without significant palea. Lemma of lower sterile floret oblong; 4-5.5 mm long; hyaline; 2 -veined; ciliate on margins; dentate; 2 -fid. Fertile lemma oblong; 4-5.5 mm long; hyaline; without keel; 3 -veined. Lemma margins ciliolate. Lemma apex lobed; 2 -fid; awned; 1 -awned. Principal lemma awn from a sinus; bigeniculate; 30-40 mm long overall; with twisted column. Column of lemma awn hispidulous. Palea absent or minute. Lodicules 2; glabrous. Anthers 3; 2.5-4.5 mm long. North America: south-central USA and southeast .